Have you noticed lately everywhere you look another commercial is advertising how they can help you select the best real estate agents? I sure have. Everyone from Glenn Beck, Dave Ramsey, Sean Hannity, Homelight, Zillow, and on and on and on. It doesn’t stop. So why are all these companies and celebrities springing up and throwing in their two cents about real estate agents? Because it’s lucrative. Do these companies really pick the best real estate agents? Probably not. Over the years we’ve been approached by nearly all of them. What they don’t tell you in the ads is that the agents selected pay either a hefty monthly fee to be recommended or a hefty referral fee on the transaction. This is money that could be used to market a seller’s property instead of being spent to secure a listing lead. If a listing agent pays 30-40% off the top to these referral companies, they lose money unless they don’t spend much to begin with. 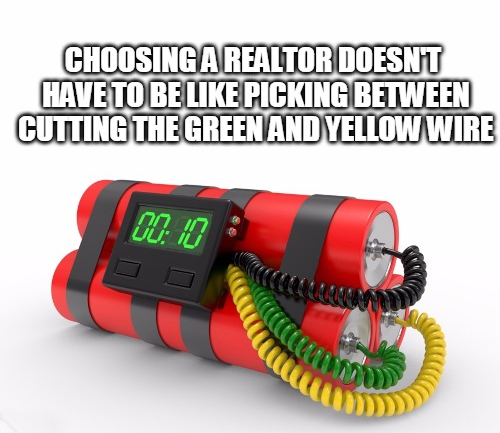 And if they don’t spend much money marketing the seller’s home, are they the best? If you’re an agent who spends a lot to market homes, why would you take listings guaranteed to lose the agent money? Some would say marketing doesn’t sell homes, the MLS does and price does. I can tell you that we just sold one of our listings for full price cash directly from a newspaper ad. In fact, we’ve sold 7 homes in the past 10 days and many came from advertising. Advertising still works, and it always will. Do you prefer an agent that pays to advertise your home or pays to advertise their name? Some people ask, is it legal for people who are not agents to advertise who they say best agents are and collect advertising fees or referral fees? That’s a tricky question. Many of these people setup a real estate company in another state so they can legally collect a real estate commission referral. Others just charge a monthly fee for TV or radio time. Some would say recommending a real estate service requires a license, even if only in advertising. We’ll stay out of the legal realm as we don’t know that answer. This article focuses on the practicalities. The Ellis Team at Keller Williams is proud that we were voted Best Real Estate Team in SW Florida by News Press readers. In full disclosure, we paid some advertising to announce that fact. We are proud that we were voted best. We don’t pay the newspaper a referral fee to be listed. They are a trusted partner and they help us advertise our homes for sale, both in print and online. Are These Paid Recommendations Really Accurate? The next time you turn on the TV or the radio, pay attention to how many services are advertising how to pick the best real estate agent. I bet you’ll be astonished. Then ask yourself, why are they taking up valuable airtime for this? Follow the money. It’s always the money. Hey, this is America. We’ve got no problem with people paying to stand out. We’ve paid to stand out over the years ourselves in various ways. Are they truly recommending the best, or recommending the agents they can get to pay to be on their service? Our team has a list of handymen, plumbers, electricians, roofers, pool companies, inspectors, etc. that we recommend to our clients. We don’t recommend them because they pay to be on our list. We do so because they’ve proven to us they give good service to our clients. Isn’t that what a recommended list should be? 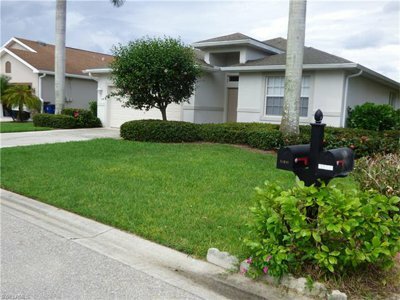 If you’d like to talk to us about selling your home, call Brett or Sande at 239-489-4042 Ext 4 if you’d like to get a preliminary value of your home go to www.SWFLhomevalues.com Or, if you’d just like to search the MLS like a pro and see what’s available, check out www.LeeCountyOnline.com Either way, we’d love to talk to you about your real estate needs and help you accomplish your goals. 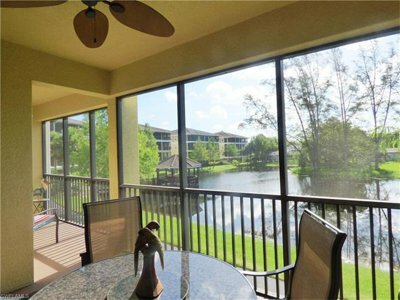 Posted in Cape Coral, Cape Coral Real Estate, Fort Myers Beach, Fort Myers Real Estate, Reflection Lakes, Southwest Florida Real Estate. I recently read an article in USA Today about how the housing inventory shortage nationwide reached 20-year low and how it’s affecting the market. While every market is local and is influenced by its own factors we do not work in isolation of other markets. Therefore, national stats are also of interest to us. For instance, if the economy is down nationwide chances are it’s affecting us here in SW Florida. 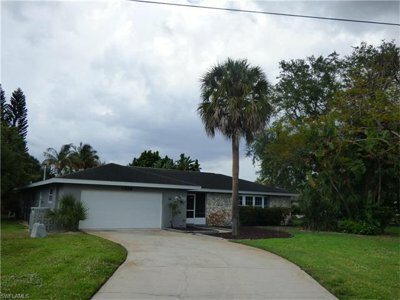 Additionally, if snow birds have a hard time selling their properties up North, they may not all be able to purchase down here. The article mentions there is a 4.3 month supply of homes on the market nationwide. Locally we calculate the supply to be 4.22 months, so we’re pretty similar to national statistics. One of the reasons mentioned in the article for the tight supply is that baby boomers aren’t likely to move in the next year. 78% of baby boomers are happy with where they live, and baby boomers own about 33 million homes. While many baby boomers would love to move to Florida or Arizona, some are reluctant to leave family and friends behind. While this is mentioned in the article, it’s not a trend we’re seeing locally. It appears to us now more than ever baby boomers are eager to move and family isn’t holding them back. Of course, we tend to deal with those that are contemplating making the move versus those that never would. Millennials have started purchasing recently which will add to tight supplies. We believe as baby boomers age they will begin to think about smaller homes, homes in warmer climates, or homes that meet their needs due to health reasons. Not every baby boomer will appreciate a 2 or 3 story home up North. Once they decide a 2-story home is no longer their best option, they may consider whether staying up North is too. It opens the whole gamut once a move is considered. Thankfully builders are building again. Unfortunately, most buyers don’t know all the building developments available to them, nor which ones are offering incentives and discounts. Most buyers don’t realize they get a better deal through a realtor than they do walking in on their own. If they walk in and ask that question the answer will be it’s the same price whether you’re represented by a Realtor or not. They may not tell you about incentives, and they certainly won’t tell you about competing builders in other neighborhoods. We’re getting early word that the Fed will scale back it’s $4.5 Trillion in bonds beginning in September. This will raise interest rates. If rates go up we could see a buying frenzy followed by a reduction in the rate of growth in home prices. Nationwide the S&P Core Logic Case Shiller home price index was up 5.6% due to low inventory. Rising rates could curtail that growth. Either way we need more homes. The economy is doing better and people are buying. If you’re thinking of selling, you might want to cash in before the stream of sellers enter the market. You can see from the chart inventory is lowest in the summer and picks back up again starting in September/October. Why compete with all the other sellers next season when you can have them all to yourself now? If you’d like to talk about selling your home, please call Sande or Brett at 239-489-4042 Ext 4 Or you can go to www.SWFLhomevalues.com and find out your home’s value for free in minutes. If you’d like to search for your next home check out www.LeeCountyOnline.com Our team can help you find your next home and sell the one you have, making it a smooth transaction. Always Call the Ellis Team at Keller Williams Realty! We’re here to help. 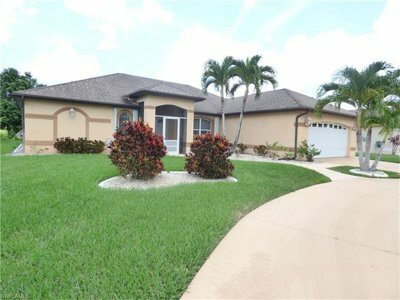 Posted in Cape Coral, Cape Coral Real Estate, Fort Myers Beach, Fort Myers Real Estate, Open House, Southwest Florida Real Estate. 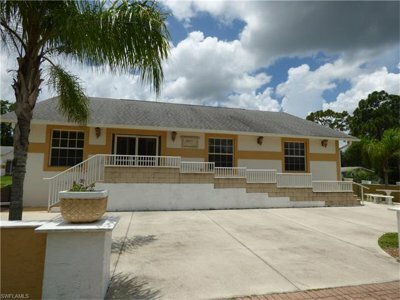 Changes Brewing in Southwest Florida Real Estate Market? Let’s start with what we know and work backwards. Homes priced $200,00 or less are flying off the shelves with multiple offers. Homes up to $250,000 are as well in some neighborhoods, but not all. This assumes the home is in good condition and priced correctly. So, you might wonder why we’re asking the question, are changes brewing in Southwest Florida real estate market? Buyers are still buying; however, we’re noticing they’re price sensitive now. Prices have gone up so much perhaps it’s testing the limits of what buyers can or will pay. Sellers are counter-offering offers and buyers aren’t just accepting that. They are negotiating back and forth until both are happy. Some buyers are walking from counter-offers. We’ve seen this over the years and it appears it’s no longer a seller’s market across the board. The numbers from June seem to bear that out as well. 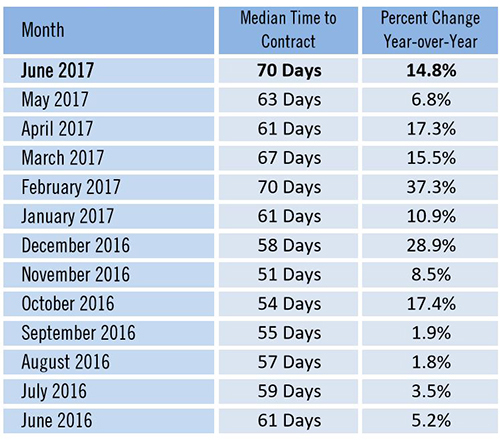 The median time to contract jumped 7 days in June from May’s numbers, and 9 days from last year. It’s taking longer to get contracts on houses. It’ll be interesting to see July’s numbers in a few weeks. 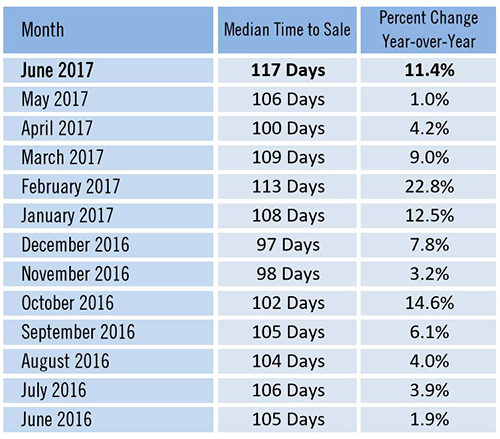 Median time to sale also jumped to 117 days. That’s a 11.4% increase from last year. New listings are up 5.8% and new pendings were down 1.6% from last year. Could these be leading indicators for sales in months to come? So, what’s the takeaway here? Sellers need to take a good hard look at their price and make sure they’re competitive. If your home has been on the market awhile, it may be time to re-evaluate where you stand. New listings could have come on the market and become instantly more attractive than your home, or other sellers may have reduced their price. Both events can affect you. Sometimes as little as $2,000 in some sub-markets can be the difference between selling and sitting. We are in a price sensitive market, primarily because prices have risen and stretched home buyers thin. They simply can’t purchase as much home as they could have a year ago. We warned buyers this would happen. And we’re warning sellers not to get too greedy now. Prices are good. Buyers are buying. We don’t have a runaway market where the seller gets to dictate all the terms. Buyers and sellers are on even ground right now, and price matters. Sellers, you’re not in competition with the buyer. You’re in competition with all the other sellers out there competing for your buyer. Buyers, same thing. You’re not in competition with the seller. You’re in competition with all the other buyers out there for the best properties. The best valued homes always sell fast. You don’t want to be late to the table and eating scraps when you could have had the best. Be prepared. Get your financing in order so you can jump when that property hits the market. To take advantage of opportunities in this market we’d suggest sitting down with us and going over your objectives. As a buyer, we can show you the best homes and eliminate the rest. Wasting time on the junk takes away time looking at the good stuff. That can be the difference between success and failure. Let an Ellis Team professional work with you and save you time. We have some other tips for you as well that we’ll save for when we meet. Sellers should have the same sit-down with us. We’ll educate you on the market, look at your competition, and show you how we market better than anybody. This can be the difference between selling and sitting on the market. Feel free to search homes at www.LeeCountyOnline.com Our database comes directly from the MLS and is always up to date, unlike some of these other sites with bad or outdated data. 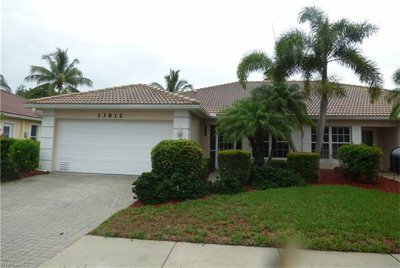 You can always call us at 239-489-4042 We’d love to help you buy or sell your next home in paradise! Some agents say the number of home sales is up. Some say it’s down. 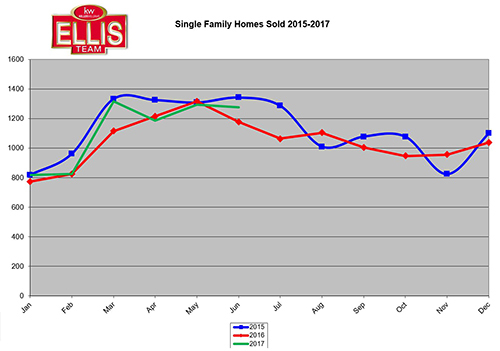 The data show 2017 SW Florida home sales trending between 2015-2016 levels. As you can tell by the chart, home sales fell off the 2nd half of the year the past two years. Home sellers wishing to sell now might get a little nervous reading this chart, but don’t be. In fact, this can be good news for home sellers. We’ll let you in on a little secret. There were 2,001 fewer listings last August than there were this February. Some sellers make the decision to sell in season because an agent told them there were more home sales in season. It’s true, there were more home sales in season. However, there were more homes to sell too. When inventory goes down home sales go down. Not because there isn’t demand, but rather because product isn’t there to sell. If you’re a home seller contemplating selling, the end of summer and fall can be an excellent time because you’ll have less competition from other sellers. 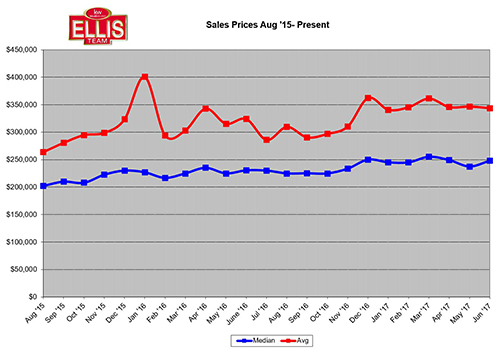 The median sales price is up 7.6% in June over last year, and the average sales price was up 6.1%. Not too shabby. You can wait until season to sell your home, and there might be more lookers for your home. There will also be more competition from other sellers for those lookers. We’re seeing new construction coming in and competing now too, which is good in a way for sellers because many local sellers don’t want to sell until they know where they’re going. Local sellers just couldn’t find an appropriate home to move into even though they’d like to make a move. We can help with that. Our team knows about several new communities and builders the public doesn’t always know about. Why? Because builders don’t advertise like they used to, so buyers don’t know where to find them. Even when buyers do stumble on a builder or new community they don’t know if it’s a good deal. That’s where a professional agent comes in. Builders advertise to agents because they know we can bring in repeat business. We find out about deals and incentives the public doesn’t hear about. 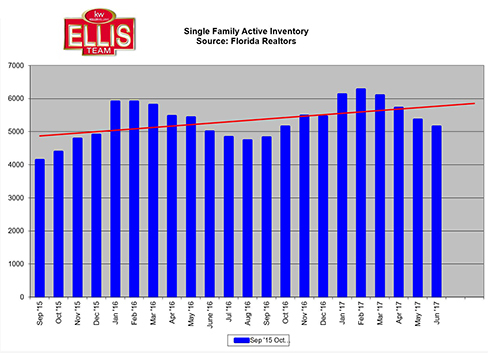 If you’re looking to make a move but you don’t know where, a free consultation with a friendly and informative Ellis Team agent might just do the trick. We can show you how much we can sell your home for and what you would net out after sale paying all expenses and mortgages. We can then calculate how much you’ll have to put down on the next home, and what you can buy for a similar payment. Perhaps you’ve had a promotion, or perhaps a loss in income and you’d like to downsize. Either way, you want a great home for the value. We can help with that. If you’d like to take your time and search on your own, try out www.LeeCountyOnline.com. You can search all the homes for free and even find out what your home is worth. If you’d like to sit down and talk to us, you can call us at 239-489-4042. Brett and Sande are easy to talk to and we like to answer questions and solve issues. We know buying and selling isn’t always as simple as picking up the phone and going shopping. There are many factors to consider, and timing it all can be important. We’re patient and helpful. If you’d like to discuss your options, we’d love to talk. Always call the Ellis Team at Keller Williams Realty! We’re here to help.